I like this passage, and Elizabeth, because they remind me that you can do everything right–love God with all your heart, soul, mind and strength; love your neighbor as yourself; follow God “blamelessly”—but life will not be perfect. There will be disappointments. There will be pain. We will suffer. Some of it we bring on ourselves. Some we won’t “deserve.” But, everyone has an imperfect life. No one is immune. Jesus didn't come to earth and die on a cross so that we could be happy. God’s love runs much, much deeper than that. Jesus came and died so we could be made holy, and if infertility is what will bring holiness, He will use it. Sometimes, though, our trials are not about us. While even the holiest of us can use some growth, Elizabeth’s barrenness wasn't about her, but about God’s glory. After all, what explanation can there be for a “very old” couple to become pregnant other than that God did it? Even beyond our holiness and God’s own glory, God is interested in our hearts, that we trust Him and grow more in love with Him. 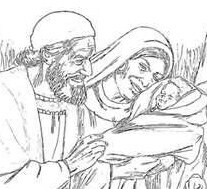 Elizabeth and Zechariah were definitely brought closer to God through their experience. And I am guessing that since all the neighbors were filled with awe, and throughout the hill country of Judea people were talking about all these things (Luke 1:65), that quite a few other people were also growing in holiness and glorifying God. That’s not due to Elizabeth’s and Zechariah’s perfect lives, but to their perfect God.